Authors: Harold F. Giles Jr Eldridge M. Mount III John R. Wagner, Jr.
Why is it important to get to equilibrium and how long does it take? Are there problems running polypropylene profiles on a single screw extruder? Does the job involve compounding color concentrates on a corotating twin screw extruder? 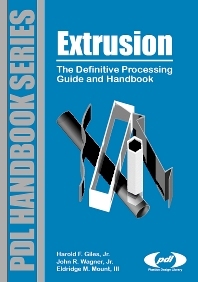 This unique reference work is designed to aid operators, engineers, and managers in quickly answering such practical day-to-day questions in extrusion processing. This comprehensive volume is divided into 7 Parts. It contains detailed reference data on such important operating conditions as temperatures, start-up procedures, shear rates, pressure drops, and safety. This reference is a practical guide to extrusion bringing together both the equipment and materials processing aspects. It provides basic and advanced topics about the thermoplastics processing in the extruder, for reference and training. Parts 1 û 3, emphasize the fundamentals, for operators and engineers, of polymeric materials extrusion processing in single and twin screw extruders. Parts 4 û 7 treat advanced topics including troubleshooting, auxiliary equipment, and coextrusion for operators, engineers, and managers. Extensive applications in Part 7 cover such contemporary areas as compounding, blown film, extrusion blow molding, coating, foam, and reprocessing. Each chapter includes review topics. Everyone involved in the extrusion industry needing a reference that deals with all the day-to-day activities in processing plastics, including troubleshooting. John Wagner is a Director of Crescent Associates, Inc., which specializes in plastic films and flexible packaging. He holds numerous patents on flexible packaging films and coating technology, has contributed to and co-edited The SPE Guide on Extrusion Technology and Troubleshooting and The Plastics Technician’s Toolbox-Extrusion, and is the Editor-in-Chief of the Journal of Plastic Film and Sheeting. He is on the SPE Extrusion Division Board of Directors.